I remember the day I realised that filling in your brows made such a difference. I got my hands on the HD Brows Kit from a subscription box like Glossybox or something similar and honestly I haven't looked back since. I used to always use a powder to fill my brows in, but now I have to say I'm a whole lot more open to what I use and generally use a bit of everything. Everyone is always talking about the brow products from Benefit, but for some reason I hadn't ever given them a go but all I can say is that I'm insanely thankful that these beauties have now come back into my life. It's blown my mind just a little bit! I got my hands on the Benefit Brow Zings Eye Brow Shaping Kit* in Medium and the Benefit Gimme Brow* in Medium/Dark and I feel as though it's changed my life a little bit. They are now my go-to brow products, and I didn't really think anything would take over from my previous favourites, but Benefit have blooming only gone and done it haven't they! If you've got a little bit of time to spare and want to perfect the brows you've seen consistently when scrolling Benefit's Instagram feed then you'll want to start with the Benefit Brow Zings kit. This is your go-to-does-a-bit-of-everything kit. Inside you'll find a tinted wax, a coloured setting powder, and two brushes to apply with alongside a pair of mini tweezers all inside a cute compact with mirror included. Start by applying the wax to keep your brows in place and add a bit of colour. This shade is more on the ashy side so it works really well for me. Next up, finish filling the brows in using the setting powder. I have to admit though, I don't use too much of this as it's a little too warm toned for me but it does the job and you can't really notice. Then I'll finish up by applying the Benefit Gimme Brow. This is the absolute stand out product for me and finishes filling in the brows and really making sure that they don't budge. The colour of this is the perfect ashy tone for me and I'm a little bit obsessed. It's got the smallest brush which makes application really easy. I've tried others of these in the past but the brushes have always been bigger and far too similar to a mascara brush and so the colour always gets everywhere - but this one's completely different and it just works incredibly. If you're short of time and are in a rush but still want to add a little something' something' to your brows then I'd recommend just popping a bit of the Benefit Gimme Brow on. This does the job and is perfect for an every day brow look, but for a power brow I'd recommend using both. If these are both a little out of your budget though, then I've found a dupe! 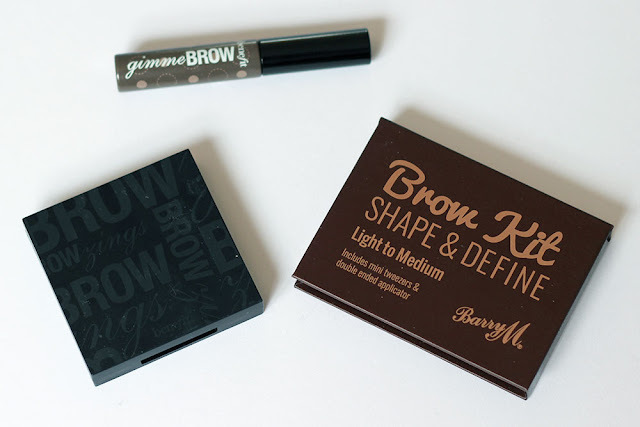 The Barry M Brow Kit* is super similar featuring both wax and powder and does the job in a very similar way. I do have to say the Benefit product pips Barry M to the post just slightly, but this is a great budget friendly option or just a back up to have in your stash. What are your current favourite brow products?